Charles Bruce Chatwin (13 May 1940 – 18 January 1989) was an English travel writer, novelist, and journalist. 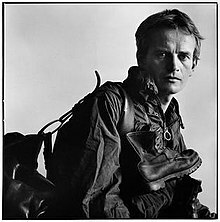 His first book, In Patagonia (1977), established Chatwin as a travel writer, although he considered himself instead a storyteller, interested in bringing to light unusual tales. He won the James Tait Black Memorial Prize for his novel On the Black Hill (1982), while his novel Utz (1988) was shortlisted for the Man Booker Prize. In 2008 The Times ranked Chatwin as number 46 on their list of "50 Greatest British Writers Since 1945." As you go along, you literally collect places. I'm fed up with going to places; I shan't go to anymore. The history of Buenos Aires is written in its telephone directory. Pompey Romanov, Emilio Rommel, Crespina D. Z. de Rose, Ladislao Radziwil, and Elizabeta Marta Callman de Rothschild - five names taken at random from among the R's - told a story of exile, desolation, disillusion, and anxiety behind lace curtains. I learned about Chinese ceramics and African sculptures, I aired my scanty knowledge of the French Impressionists, and I prospered.